Per the USPS standards, vertical (4B) mailboxes are only to replace existing vertical (4B) mailboxes. 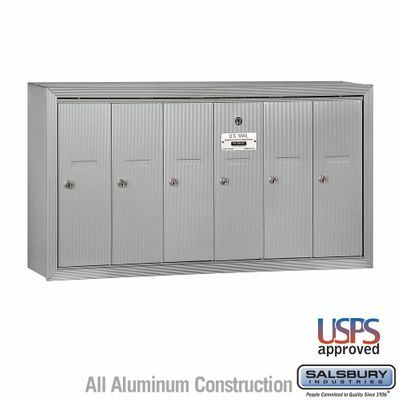 All new construction should use 4C Cluster Mailboxes, per USPS regulations. 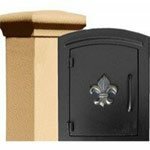 We strongly advise that you discuss installation with your local post master. See DisclaimerTypically for commercial use -- not for residential use. The USPS will need to install their arrow lock to retrieve mail. 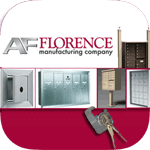 Please check with your local Post Office to confirm that they will install the lock and service the drop box. 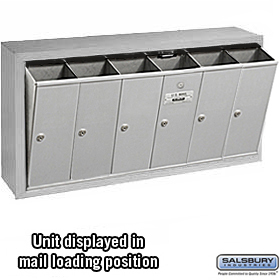 Salsbury's 4B+ Vertical Mailbox units are an ideal mail solution for apartments, condominiums, commercial buildings, and anywhere multiple tenant boxes are needed. Available as a surface mounted or recess mounted unit, the streamlined design can be stacked two units high if wall space is limited. 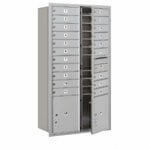 The top-loading system can be utilized for either USPS or private use and allows for ease of use when depositing mail. The access door unlocks the entire compartment array, which slides forward for easy mail drop-ins. With its durable powder coat finish and all aluminum construction, Salsbury's vertical mailbox will provide years of reliable, maintenance-free service. 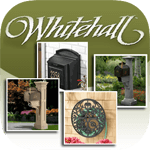 Mailboxes should be shielded from direct weather conditions, so it is recommended that these units be installed indoors only. 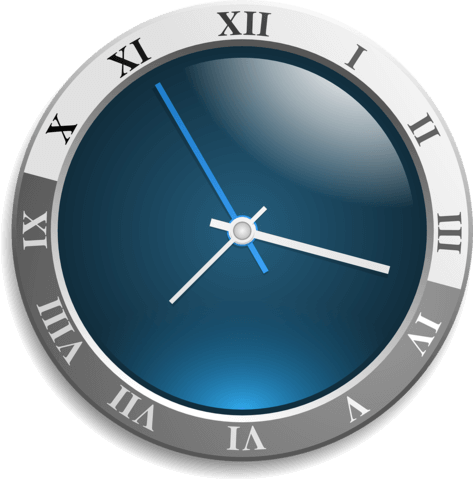 Units are recommended for indoor installation only, shielded from direct weather conditions. Outgoing Mail Slot measuring 4 ¾ in. W x ½ in. 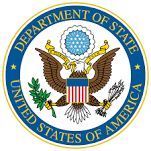 H (in the far left door of the unit unless otherwise specified) *Order unit with one additional compartment than the total number of tenants receiving mail. 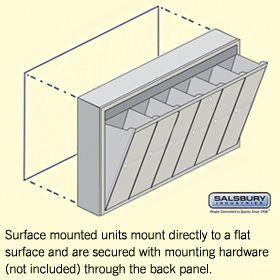 Follow the included instructions for surface mounted or recessed mounted units. Installation hardware is not included with your mailbox purchase. 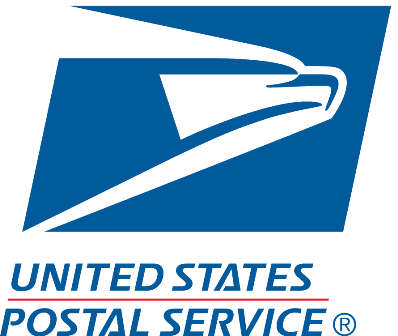 The USPS will provide and install its own master lock on your mailbox unit; therefore, after installing the mailboxes, contact your local Postmaster for installation. 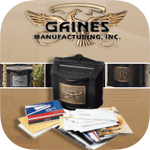 The hardware and instructions for installing the master lock are included in your packaging. Please provide the hardware and instructions to the USPS representative when they arrive to install the lock. If for private use, purchase the Master Commercial Lock with your mailbox and it will arrive installed by the factory. 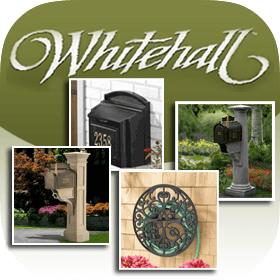 No more than two tiers of mailboxes may be installed. For recessed units, the wall opening and lumber frame must be square. Mailboxes should be shielded from direct weather conditions. 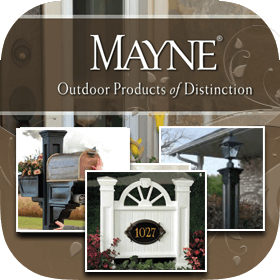 These units are recommended for indoor installation only. Store keys in a safe place until ready for use. Hardware is not included to fasten units into rough opening. 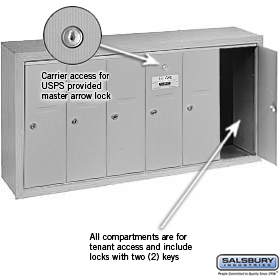 The tenant door at or near the center of the compartment array (door marked "U.S. Mail), in addition to providing access to a tenant's mail, also provides access to the USPS Arrow Lock that provides access to all compartments. For the sake of security of the entire compartment array, it is important that this tenant door is securely locked at all times, even if there is no tenant receiving mail via this door. 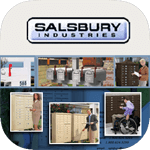 Question: Are these Salsbury vertical mailboxes available in surface and recessed-mounted units?